Skaneateles Schools Cayuga County taxes & 1 yr Home Warranty! 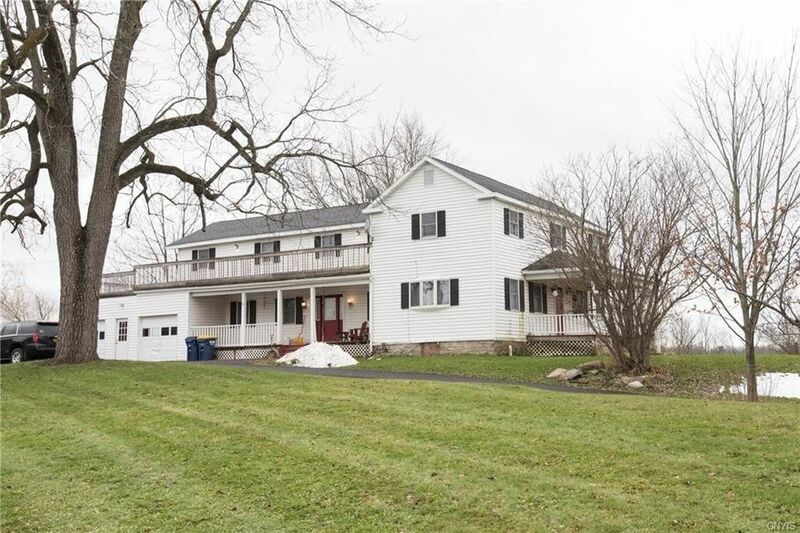 This 2,780 sq ft 2 Story colonial sits on 1.7 acres in a country setting. The home has a large double living room with hardwood floors, dining room with built in china hutch & hardwood floors. A large country kitchen (all appliances included), mud room and attached 2 plus car garage. The second floor has 4 bedrooms and 2 full baths. The home has a large wrap around deck accessible from 2 of the bedrooms. The large master bedroom & master bath is currently being remodeled as well as bedroom #4. The home has a new forced air furnace, pellet stove, new carpeting upstairs, 200 amp updated electrical, new paved driveway and the roof is 8 yrs old. This beautiful country home has all the modern amenities with the charm of turn of the century farm house. Directions: Heading east on E Genesee St from Auburn. The home is 2 miles from Auburn on the right hand side.